POMONA, Calif. (Apr. 7, 2005) � In baseball terms, the first Twilight Cruise Night of the season at the Wally Parks NHRA Motorsports Museum was a grand slam. In hot rod terms, it was simply bitchin�. But no matter how you describe it, it was a super-strong opening show with 463 classic rods and muscle cars blanketing two Museum parking lots at the Fairplex in Pomona. 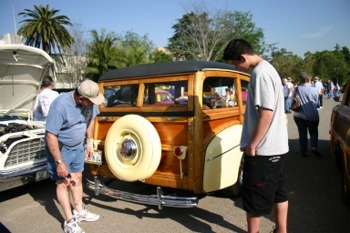 Maybe it was the unexpectedly long So-Cal rainy season, the first 85-degree plus night, rodders itchin� to show off their cars � or all of the above � but approximately 1,200 people made this the biggest opener and one of the top-attended events in the event�s six-year history. �I�d take this one home,� joked judge Tony Thacker, VP of marketing at SO-CAL Speed Shop, who tabbed Butch Debie�s incredible cinnamon-colored 1960 Pontiac Bonneville. 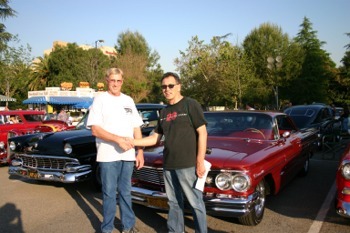 Debie, from Chino, Calif., thanked Thacker for picking his car, but no, didn�t give him the keys. 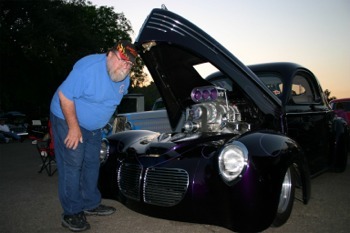 This time around, the monthly �The Look� award, chosen by J.R. Martinez Design and Power Puzzles, went to Richard Hibbard�s black beauty, a 1957 Chevy two-door. Hibbard, who lives in nearby Claremont, is well-known as the owner of Hibbard Chevrolet. 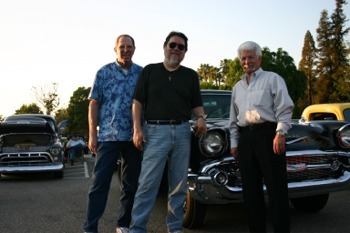 Joe Martinez and Gary Moline give the Museum a $50 donation in the name of �The Look� award winner each Cruise Night. 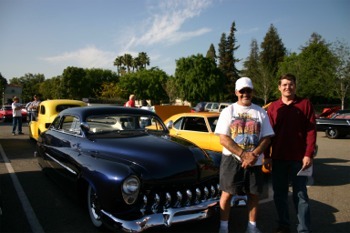 Kevin Lee, editor of Rod & Custom, meticulously picked his top choice, a dark �50 Merc owned by Sam Falco of El Monte, Calif. �It�s a nice, good traditional style car that caught my eye,� Lee said. Falco, who attends every Museum Twilight Cruise Night, but doesn�t always bring his car, said the Merc won �The Look� award here three years ago. 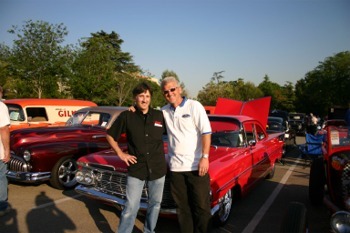 Another Chevy won as Primedia Online Editor Nick Licata, an acknowledged �Ford guy,� broke rank and picked Carson Lev�s red-red �58 Bel Air. �It�s awesome,� Licata said repeatedly. Lev, who recently left Mattel Hot Wheels to form his own company, Redphin, was all smiles after winning the award and, yes, had a Hot Wheels version of his car hanging from his rearview mirror. 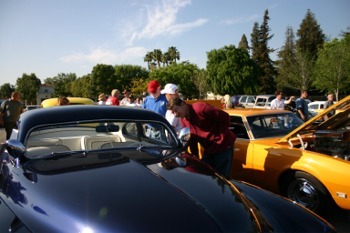 Automotive journalist and author Bob McClurg picked the evening�s final winner, a gorgeous Aria 604-41 Willys coupe owned by Mike and Aida Nordahl of Alta Loma, Calif. The Wally Parks NHRA Motorsports Museum, presented by the Automobile Club of Southern California, houses the very roots of hot rodding. Scores of famous vehicles spanning American motorsports history are on display, including winning cars representing 50 years of drag racing, dry lakes and salt-flat racers, oval track challengers and exhibits describing their colorful backgrounds..
With all the superior cars, the evening�s celebrity judges had their work cut out for them. The five winners chosen will participate in a pre-opening ceremonies parade at the Automobile Club of Southern California NHRA Finals in Pomona this November. 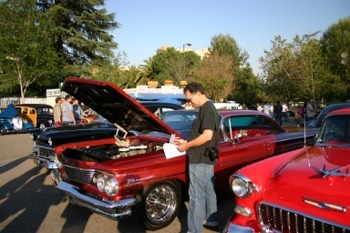 Scheduled for the first Wednesday of the month � from April through December � Cruise Nights transform the popular Motorsports Museum in Pomona, Calif., into hot rod heaven as cool pre-1970 rods, customs, classics and muscle cars fill two parking lots. Next Twilight Cruise is set for Wed., May 4th. Cruise Nights, which run from 4 p.m. to 8 p.m. and are hosted by the Cal Rods car club, include raffles, prizes and a huge 50/50 drawing. Admission to the Twilight Cruise is free, and all who attend receive free admission to the Parks Museum as well. Food and beverages are available for purchase. The Parks Museum is open Wednesday through Sunday, 10 a.m. to 5 p.m., PST, with extended hours during NHRA national events. Current NHRA members are admitted free. Admission for non-members is $5 for adults, $3 for seniors 60 and older, $3 for juniors six through 15, and free for children under the age of five. The Parks Museum is also available for private parties, meetings, corporate events, weddings and special group tours. 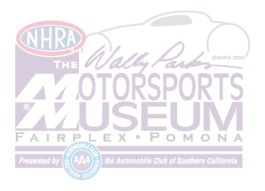 The Wally Parks NHRA Motorsports Museum is located at Fairplex Gate 1, 1101 W. McKinley Ave. in Pomona. 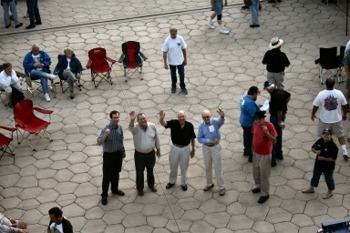 For further information on special exhibits, museum events or directions, call 909/622-2133 or visit museum.nhra.com.